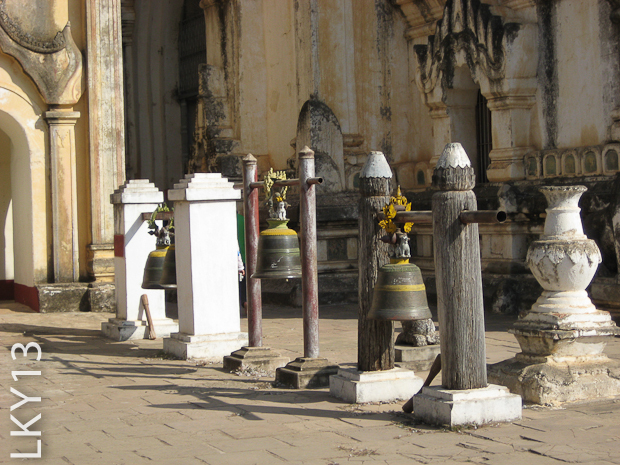 Many years ago we visited Thailand and were ‘templed out’ after a couple of days. 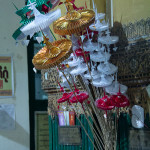 I think because they were all very similar, all very busy and apart from one we visited in Chiangmai, they didn’t really seem to have much to differentiate them from any of the others. 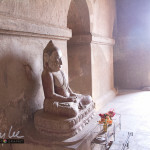 There was enough variety in the temples of Laos and Vietnam to keep us interested and Angkor is, well, Angkor. 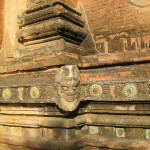 You really appreciate just how magnificent Angkor must have been in its golden age only after you visit Myanmar. 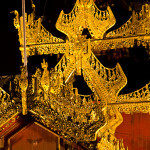 You can imagine what the temples would have been like with their roofs and stucco, their gold leaf, jewels and frescoes. 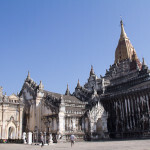 There are differences of course, the shapes are different for a start and the temples in Myanmar all look like they had an ice cream upturned on the top. 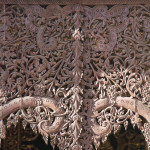 Angkor has been described as a grand Chinese dinner, served course by course. 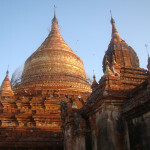 Myanmar, in particular Bagan, is a smorgasbord Of the estimated original ten to twenty thousand stupas and pagodas, only about two thousand remain. 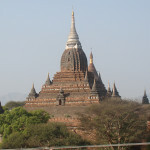 Some have been lost over the years through attrition and earthquakes but many have simply been washed away by the Irrawaddy river as it eats into the bend of the river around old Bagan. 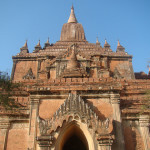 The first temples in Bagan were probably built from around two thousand years ago, but most were constructed over about four hundred years from the mid 9th Century, until the kingdom was over-run by the Mongols at the end of the 13th Century. We’d have loved to see the lot from an early morning balloon ride, but at nearly $300 US a pop, that was out of the question. So we went by horse-cart. Our driver Ko Ko took us around the main temples except for the Shwezigon Temple which was a bit far for our horse, but the others were just as impressive in their own ways. 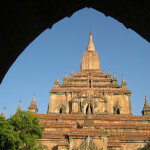 We set off from our hotel in New Bagan heading North to Old Bagan, stopping on the way to visit the Nagayon Guphaya in Myinkaba. It was built in the 11th Century by King Kyansittha after he was sheltered by a snake which covered him with its hood as he slept. 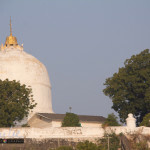 A short walk away is the Lay-Myet Hna Pagoda which has a terrace you can access via a small dark staircase, but affords you a wonderful panoramic view of all the other large temples laid out to the north and west of you. When you descend, the caretaker is very happy to show and he hopes, to sell you, one of his sand paintings. 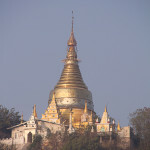 A little further on, we made a quick stop off at the Apeyadana Pagoda, before heading for Myinkaba town. 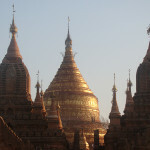 Tucked in behind a row of laquerware workshops, you will find the Gubyaukgyi and Mayazedi Pagodas. 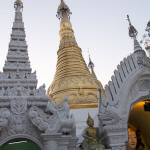 The Gubyaukgyi pagoda has some rather impressive stucco detail at eye level, but it is well worth it to continue on to the Mayazedi Pagoda next door past lots of enthusiastic but relaxed sellers of sand artwork. 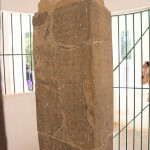 Here you’ll find the Mayazedi pillar, the Myanmar version of the Rosetta stone. 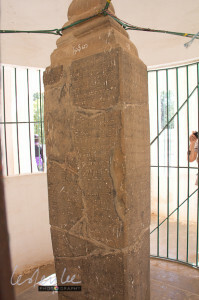 Carved into each side of the stone is the same description of Prince Rajakumar’s feelings towards his father, in four different languages, Pyu, Mon, old Burmese and Pali. I guess he was just making sure the point was made. 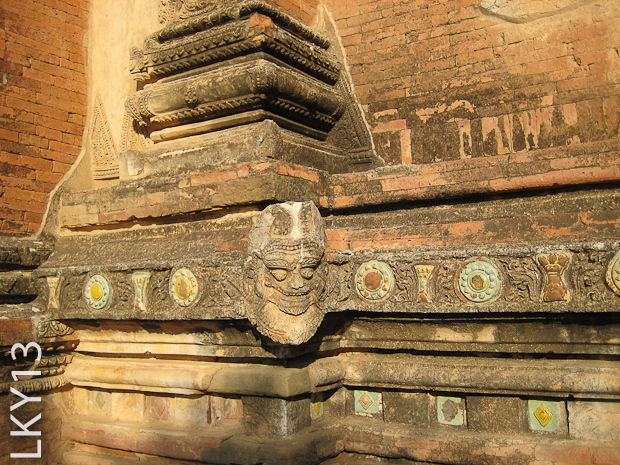 Ananda is surely the most beautiful of all the Bagan temples, with it’s impressive frescoes and the four Buddhas of the four ages. The frescoes are being slowly restored, and a walk around the grounds so you can view the temple from a distance is a rewarding exercise. We made sure we gave the bells a good beat as we went by for good measure. 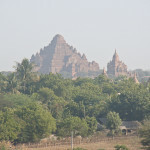 Dhammayangyi is the largest of all the pagodas and looks like one of the Egyptian pyramids from a distance. The brickwork is very well done and the fit is said to be too tight for even a fine blade to penetrate the joints. 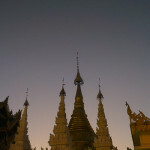 Thatbyinnyu Pahto is the tallest, not by a lot, but the golden spire makes sure of that, reaching to 62 metres. 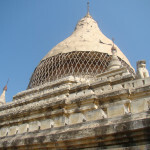 Dhamma Ya Zi Ka Pagoda is unusual in that it has a pentagonal terraced design. 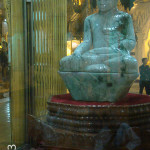 Four sides are for the already revealed Buddhas, the fifth is waiting for the one yet to come. We arrived just in time to climb up to one of the western facing terraces to see the sun drop behind the hills. 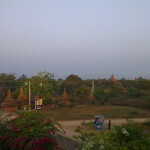 Sunset in Bagan seems to be pretty reliably spectacular. 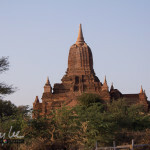 In most places you need to have some clouds to give definition, but the sand in the atmosphere around Bagan, even if it’s not too obvious, brings out the reds and adds an extra dimension to the stupas laid out before you. 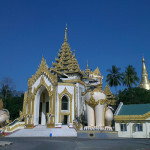 Each of these beautiful buildings was worth the visit but we barely scratched the surface. A look on the internet lists far more than we managed to see in our brief time, you could happily spend a week of more in this lovely location and still not see everything. 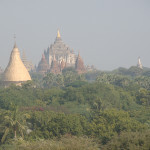 We probably sold ourselves short by spending only one day in Mandalay, there are lots of side trips we could have done and we didn’t even make it up Mandalay Hill. The town itself, at least the part we wandered around, is quite dusty particularly once you get off the main streets, but the people are friendly and will point you in the right direction if you get lost. 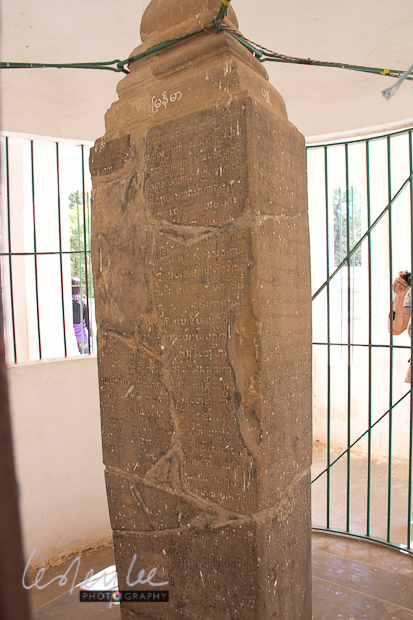 We found a Hindu temple down a back street, though we didn’t go inside. 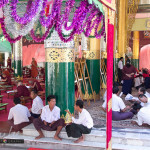 Myanmar is a melting pot of cultures and there are many mosques and churches alongside all the Buddhist temples. 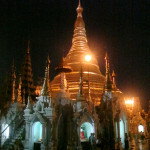 If you have no time or inclination to visit any pagoda in Yangon other than one, choose between the Sule Road and the Swedagon Pagodas. 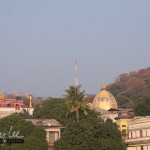 We were staying in Sule Pagoda Road and thus walked round the Sule Pagoda a number of times, admiring it from all angles, including from the over-bridge on the western side that skirts the pagoda itself at the upper terrace level. 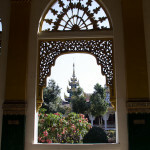 You can also get a wonderful view of the pagoda from the footbridge over the road, a block north. 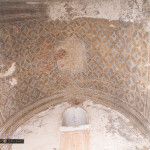 This is the space that was filled with thousands of demonstrators in 1988 during the uprising of students and monks against the government. 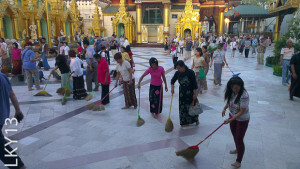 The other rallying point was around the Shwedagon Pagoda, to the north of Sule Pagoda. It is a magnificent building, visible from many parts of the city and worthy of an afternoon and evening set aside for a visit. 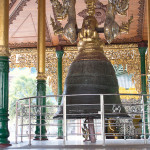 As with all the pagodas, temples, stupas, however big, small or seemingly unimportant, they are all revered places and no footwear is allowed, including socks. 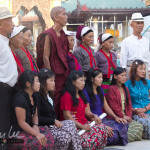 You are also requested to cover your shoulders and knees, and men in shorts will be offered a longyi to wear to cover up. Apparently the Northern entrance is pretty impressive, but we weren’t at all disappointed going in at the western entrance hall. There is a separate entry for foreigners and you can safely leave your shoes in the shelves there after paying your entry donation of $5. We didn’t mind walking up the long flight of stairs. There is an escalator, but it wasn’t running and there is a lift at one of the other entrances. 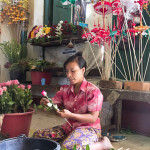 We stopped to buy some flowers so we could make offerings at the little shrines around the main pagoda. 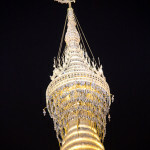 Which shrine you go to depends on the day of the week you were born, with Wednesday having a different one for morning and afternoon/evening. As we made our way into the complex, a young chap attached himself to us and sort of took over as our guide. We didn’t have the heart to send him away, especially as he was a mine of information. After we’d done one round, we decided we wanted to sit and wait for the sunset so we gave him a little thank you for his help and he went off happy. He’s a student at one of the universities and apparently lots of students earn a bit of income taking people around. 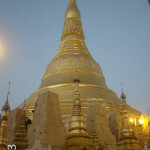 The Shwedagon Pagoda is enormous. 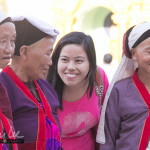 It is home to many monks, though not as many as before the uprising. A lot were arrested and some decided to go home. The whole complex has lots of small pagodas, stupas, shrines and each one is unique. 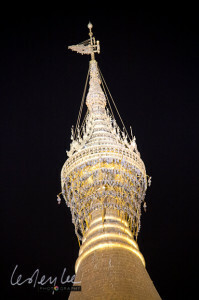 There are gold ones, white ones, highly ornamented ones. 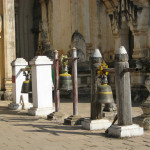 Two huge bells have their own homes and there is a small museum / gallery where you can find out about the buildings and detailing. 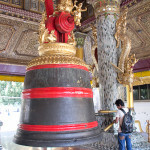 We found out the the finial on the main pagoda holds a huge (that’s HUGE) number of precious stones – diamonds, sapphires, rubies one of which is around 80 carats, probably a bit big for my finger. We also learnt by listening in on someone else’s guide, that if you stand on a certain tile, you can see one of the diamonds blinking. We tried it and yes, it’s true and it changes colour as well. Taking a photo was something more of a challenge though, since it’s right up high. 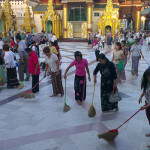 By the time we’d wandered round a couple of times and watched the people doing good works sweeping or washing the floor, watched the group of local ladies in ethnic dress having their photo taken, watched the monks taking their exams, praying, meditating or honouring the deities, we decided to head back to our hotel. 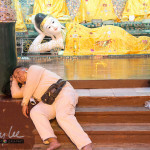 We weren’t the only tired ones, I spied one chap reclining in front of the reclining Buddha statue, fast asleep. I was torn. Would I take a photo or not. Would it be rude? I always prefer to get some sort of acknowledgement before or after taking, but he was out for the count. 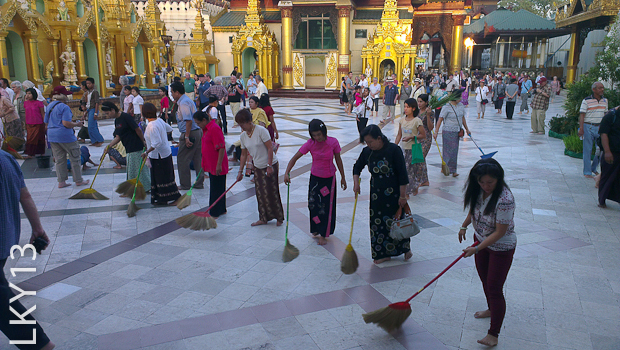 Then I noticed the lady beside me giggling away and snapping enthusiastically with her phone camera. I made a bit of a ‘should you’ expression, but she laughed some more and asked me to take some too, telling me it was her brother, so go ahead.